Fresh squash and tomatoes are paired with Vidalia onion and sweet bell peppers, topped with cheese and buttered bread crumbs and baked. Vidalia onions, okra, vine ripe tomatoes and green beans, freshly shucked corn, butter beans, southern peas and sweet bell peppers, yellow crookneck squash, zucchini and garden fresh cucumbers. 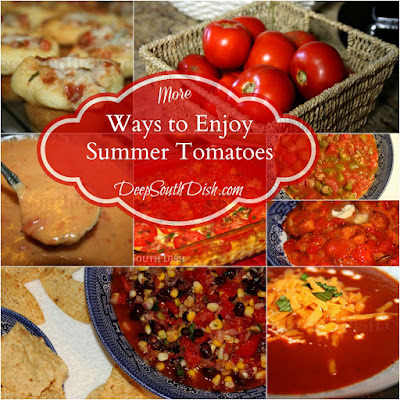 I just love the veggies of summer. Have you gotten your fill yet? An easy, pan-style, baked party cheesecake, made with cream cheese, sugar, lemon, eggs and vanilla, on a graham cracker crust, finished with a layer of sour cream and topped with your favorite canned pie filling. 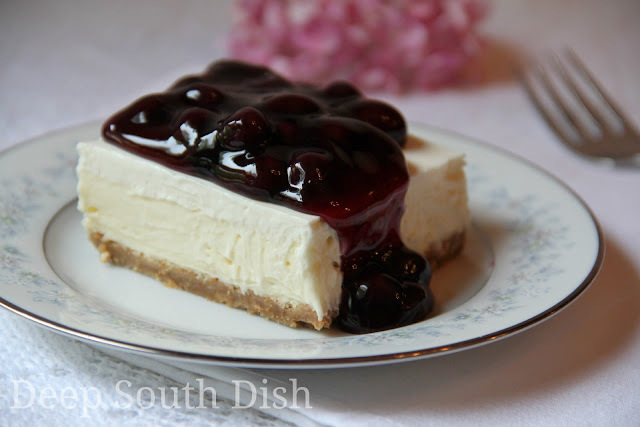 This party cheesecake has been around for many years, and was pretty popular back in the 70s. Yep, you guessed it - this is another old recipe that falls back to the days of my good ole battered Bell's Best cookbook! I'm pretty sure that it picked up the name party cheesecake because it was easy to make, portable, and it quickly became a potluck favorite. Now, while this is indeed what one would consider a cheater cheesecake - meaning it doesn't qualify for the real deal award requiring a springform pan, water baths and careful handling - trust me when I say it's still a tasty cheesecake that I think you'll enjoy, and certainly a lot less fuss and worry. I don't think you'll have any complaints about it, or any leftovers. Sweet iced tea infused with a watermelon puree. 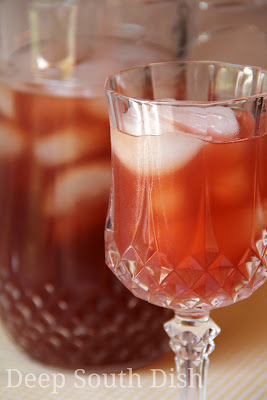 I was browsing through some old cookbooks recently and ran across iced tea made with watermelon more than a few times. I have to say that I was intrigued. I love my iced tea method, and I love flavored iced teas too, but admit the thought of a watermelon iced tea seemed, well... a little odd to me. I really wasn't sure if I would like it to be honest, but with watermelon season here, I was game. Not only did I find that I liked it, I ended up loving it. 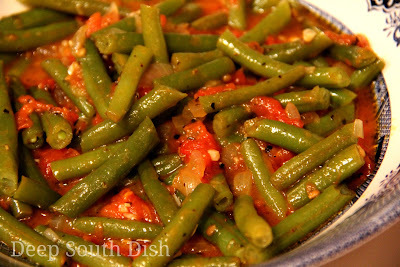 Garden fresh green beans and tomatoes stewed down with sweet Vidalia onion, brown sugar and seasonings. I just love this time of year when fresh garden produce is in abundance and so flavorful, and green beans are right up there as one of my top favorite summer vegetables. Freshly picked, fresh green beans have such a distinct texture and flavor over any frozen or canned product, though I've certainly used my share of both of those too, and either will work here as well. When summer rolls around though, beans are one backyard garden staple I almost always plant. They grow well, provide a generous crop and are easy enough to put up in the freezer, if you aren't interested in canning what you don't manage to consume. 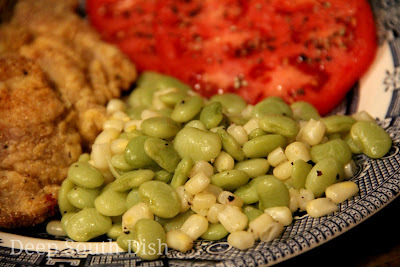 Basic succotash is a side dish made using baby lima beans and corn. 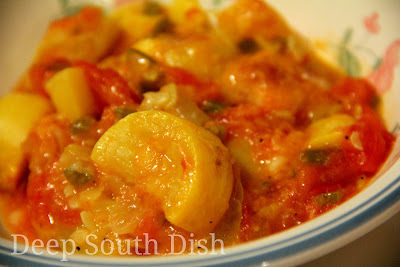 Pictured here with sliced fresh Creole tomatoes and pan-fried pork chops. Succotash is a dish built around corn and some kind of bean. Here in the Deep South, that is generally baby lima beans, though there are many regional variations across the country. It's a dish that's been around a long time, being taught to the colonists by Native Americans - though they would have originally used a bean other than lima beans, since limas came to us from South America a bit later. The term "succotash" is generally thought to mean boiled corn kernels and originating from the word msickquatash used by the Narragansett Indians of Rhode Island. 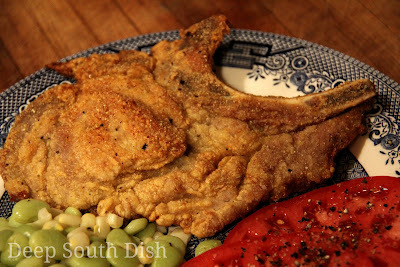 Thin cut pork chops, dredged in a well seasoned blend of onion enhanced flour and cornmeal and pan fried in a cast iron skillet. 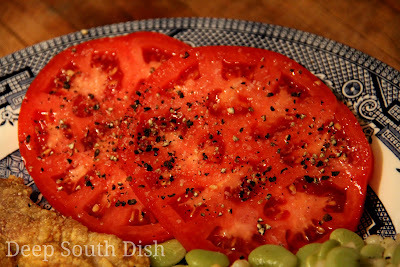 Pictured here with succotash and fresh sliced Creole tomatoes. I have mentioned before how much I enjoy watching my husband eat a pork chop. He will gnaw every slap inch of that chop into submission! Don't you just love when somebody chows down on your food like that? A home cooked meal is an expression of love from the person who prepared it for you, and the best compliment is when somebody expresses how much they are enjoying that meal. To me, there is no better applause.